Goodwin was honored Feb. 5 at Cal Poly by Paul Welch, former executive vice president of the American Institute of Architects, California Council. "I am humbled by the company that I keep with the other award winners and the award’s namesake herself,” Goodwin said. “Over the past 10 years I have seen a lot of ups and downs in the economy, my businesses and my personal life. It means a lot to have someone recognize the work I do when sometimes it is hard to see through the weeds as you are standing in them." He started participating about 10 years ago in architectural competitions for housing the homeless in the skid row area of Los Angeles through the use of innovative building systems such as shipping containers. For the past few years, he’s collaborated with the Skid Row Housing Trust as part of the third-year architectural studio that he teaches at Cal Poly. The Skid Row Housing Trust, a nonprofit that provides permanent supportive housing for homeless individuals, was also honored with the Norma Sklarek Award for collaborating within the architecture profession to directly affect the betterment of society. In the design studio, Goodwin tasks third-year students to envision a supportive housing project for the community in Skid Row, with the Skid Row Housing Trust, the Downtown Women’s Center in Los Angeles, or Transitions – Mental Health Association in San Luis Obispo, as his students’ client and point of contact for their work. "The amount of exposure my students have to the profession and the greater issues in our society after they participate in my studio is important to me,” Goodwin said, “because I don’t want to train architects but rather decent and caring adults. In my opinion, this is one of the best attributes you can have as an emerging professional in our industry to ensure longevity and flexibility." 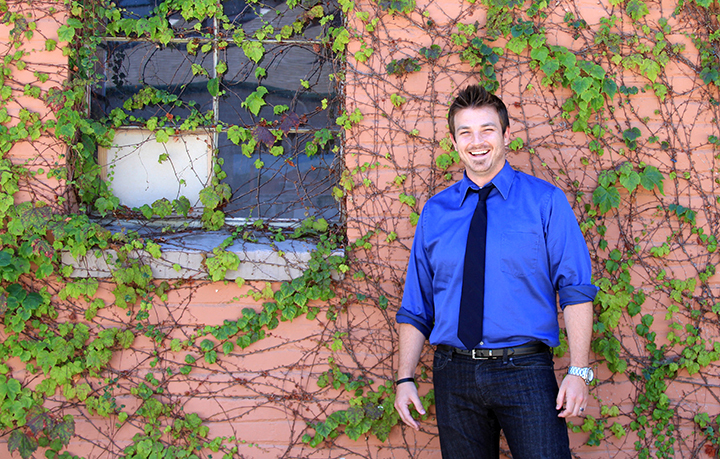 Goodwin, who earned his bachelor’s degree in architecture from Cal Poly in 2008, has taught at the university since 2014. Previously, he co-founded and served as principal architect for ConsciousBuild Inc., a design, build and development firm with its roots in sustainability and design activism. He later created RED Studio Foundation, which provided socially responsible design services for nonprofits. In 2013, it became part of the nonprofit design organization Journeyman International (JI). "Andrew is an inspiring role model for the next generation of architects," CAED Dean Christine Theodoropoulos said. "He teaches students the value of design as a fusion of human caring and craft, and opens doors for them to make a meaningful difference for the communities they serve." Separately, Goodwin has also designed a system of primary care clinics and vocational schools for the African country of Mauritania as part of an effort championed by Dr. Ahmad Nooristani, founder of the SLO Noor Foundation. Locally, Goodwin recently provided design work for the city of Guadalupe for its effort to refurbish a park and community center. Additionally, Goodwin co-founded and served as the inaugural editor-in-chief of PUBLIC Journal, a quarterly publication dedicated to providing a larger platform for the impact design movement. The Skid Row Housing Trust will be honored in the spring by the American Institute of Architects, California Council. To learn more about the award, go to http://www.aiacc.org/2017/12/08/two-recipients-named-humanitarian-award/. For more on Goodwin, visit https://www.andrewgoodwin.us/. To learn more about Cal Poly’s Architecture Department, go to https://architecture.calpoly.edu. Photo information: Photo courtesy of Andrew Goodwin.